The commission Gov. Dannel P. Malloy created in the wake of the 2012 massacre of 26 students and staff at Sandy Hook Elementary School will consider a draft report Friday recommending a further tightening of Connecticut’s gun laws, a prospect unlikely to find traction in the General Assembly. Like many previous reports, the commission’s draft also describes a need for better integrating mental and physical health care, reducing fragmentation, providing more holistic services and reducing the stigma that many people with mental illness face. The draft also points to the need to focus not just on treating mental illness once it develops but on preventing mental health problems and fostering healthy development, starting in children’s earliest years. “Through reasonable, constitutionally permissible regulations applicable to long guns, handguns and ammunition, the commission seeks to minimize to the greatest extent possible the number of gun-related civilian deaths,” the draft says. In 2013, after the Newtown killings, state legislators changed the state’s gun laws to ban the retail sale of military-style weapons and high-capacity magazines, and to expand background checks on gun purchases to include private sales outside a store. A spokesman for the Democratic governor was noncommittal Thursday about whether Malloy is interested in launching another gun debate. “We’ll take a good look at their recommendations and find out what we can do this session,” said Mark Bergman. Senate President Pro Tem Martin M. Looney, D-New Haven, said he does not anticipate the legislature imposing further restrictions on the purchase or ownership of firearms or ammunition with one possible exception: Allowing police to secure weapons at a judge’s discretion in domestic violence cases. Require every firearm to be registered. Currently state police estimate nearly 2 million firearms in Connecticut are unregistered. Require ammunition sold or possessed in Connecticut to have a serial number on the shell that would allow authorities to track “straw purchases” of ammunition and aid police in solving gun-related crimes. Require a “suitability screening process” for anyone wanting to purchase, sell or carry a firearm. 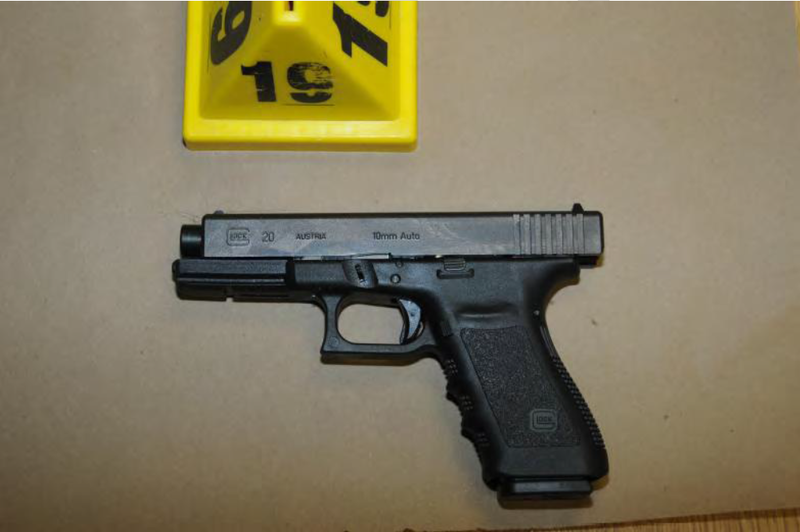 “The Commission finds that certain individuals are not suited to own, possess or use firearms. A mental health diagnoses, alone, should not serve as a basis for unsuitability,” the draft report says. 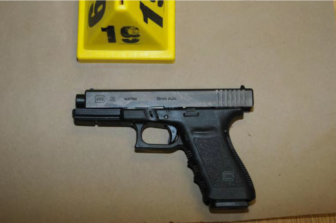 The Glock Pistol Adam Lanza used to kill himself after killing 26 children and educators. Allow a judge to temporarily remove any firearm or permit to carry from someone subject to a restraining or protective order that the judge believes could be a threat. “The Commission believes that the time period between the ex parte request and the issuance of a full restraining order, civil protection order or family violence protective order, constitutes a period of critical danger, one that must be recognized under law and addressed via judicial discretion.” This is a change that Malloy announced last week he supports. Require that a permit to carry guns only be renewed after testing the individual’s understanding of the law. Limit how much ammunition can be purchased at one time. Require trigger locks to be provided with the purchase of a gun. “The Commission found that when firearms are present in a household, insufficient safeguards often existed to prevent household members or guests who should not have access to the firearms from gaining access,” the report found. Require gun clubs to report any negligent or reckless behavior with a firearm to state and local authorities. Require gun show promoters to get a permit from the local police or elected official. Turning to the mental health portion of it s report, the commission offered stark words about the challenges facing people with mental health needs in the state, describing a “fragmented and underfunded behavioral health system tainted by stigma,” in which many people are denied needed care. The group suggested that schools increase the availability of guidance counselors, social workers, psychologists and other behavioral health professionals, and offer after-school and possibly Saturday hours. Schools should develop risk-assessment teams to gather information on, and respond to children, who might pose a risk to others or be at risk themselves because of trauma, isolation or other significant problems. Include information about social-emotional development in curriculum, helping children to identify and name feelings like frustration, anger and loneliness that could contribute to problem behavior, and teach children how to use problem-solving skills to manage conflicts. The commission cited school-based health centers as particularly useful ways to ensure that students have access to preventive care and mental health services, and noted that they could offer students a way to address mental health issues in environments free from stigma. One recommendation, which drew criticism from home-schooling families when it was discussed last year, calls for requiring families that home-school children with emotional, social or behavioral difficulties to give their local schools superintendent annual progress reports developed by an individualized education program team. Phasing out insurers’ use of separate companies to handle their behavioral health benefits, which the commission said contributes to fragmentation and serves people poorly. Despite that, the commission repeatedly cited the state’s Behavioral Health Partnership, a carve-out that oversees publicly funded mental health coverage, as a positive example of integrated approaches to care. Require commercial insurers to cover the “full panoply” of services available in the public mental health system, which tends to cover a broader array of programs including housing and job supports. Have an independent entity such as the Office of the Healthcare Advocate handle appeals of insurer denials of care and require insurers to provide reimbursement for care while their denial is under appeal. Place the burden of proof on an insurer to demonstrate that treatment is not medically necessary if it denies coverage. Require health plans to maintain up-to-date lists of participating providers and develop a mechanism for the state to fine or otherwise hold accountable those whose lists are inaccurate. The commission was unable to reach a recommendation about the use of involuntary outpatient commitment, in which a person who is not hospitalized could be ordered by a court to receive treatment. Connecticut is one of just a handful of states that does not allow the practice. Some people advocated for it in the wake of the Sandy Hook shootings, but faced significant push-back from patients and advocates. The report also echoes recommendations made by other agencies that all new or renovated schools have classroom doors that can be locked from the inside, and that schools develop a protocol for providing keys to teachers and staff.